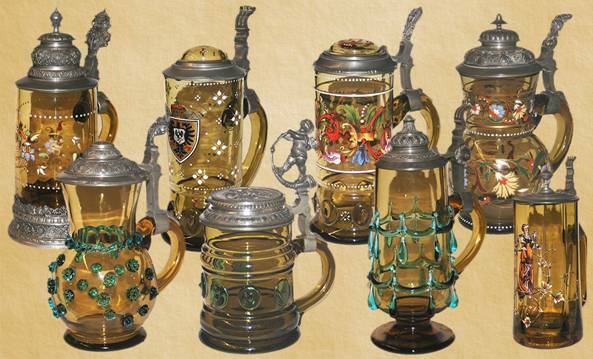 A GUIDE TO RECOGNIZING ANTIQUE (1880 -1910) THERESIENTHAL BEER STEINS AND OTHER DRINKING VESSELS PRODUCED BY THAT FIRM. 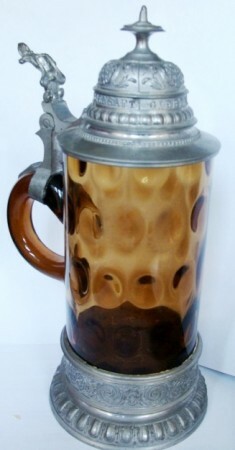 While I was shopping for beer steins on eBay and other web sites I have found a great deal of confusion on articles produced by what is called “Moser”, “Meyr’s Neffe” , “Harrach” and some other well known Bohemian glass huts that produced heavily enameled vessels of this period being studied, i.e. 1880 -1910. 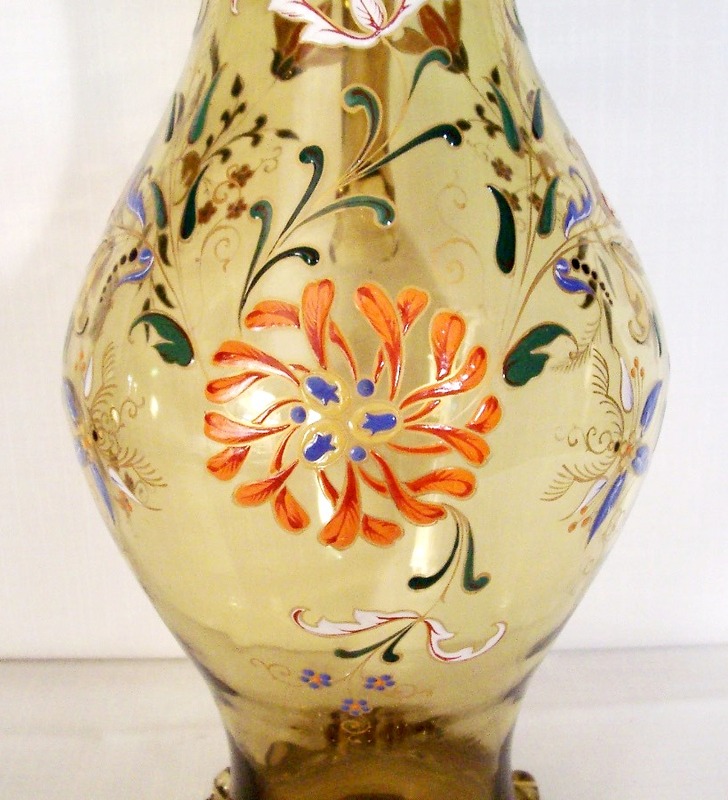 Most of these small decorating techniques and patterns shown in this article were also used by several of the famous Bohemian glass huts before and around the turn of the 20th century. The small white dot patterns were used by many firms such as Harrach and Theodor Witzka to name just two. However, the other firms seldom used the white dot patterns as many times on the same piece as Theresienthal. In the case of the Harrach firm, they would use both white and gold dot patterns on the same piece, sometimes alternating. 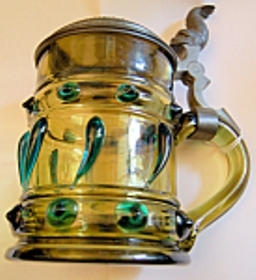 Harrach, Eggermann, Phofl and other Bohemian firms of the time also used a much different shade of green glass, mostly a bolder and darker green. 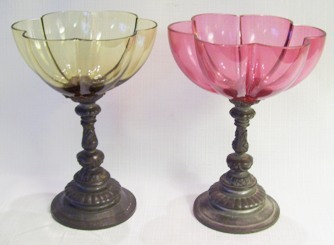 The Heckert firm used a very similar color glass but the vast majority of their items are signed with “F/H” and a number. The closest in quality and decor were items made by Josephinenhutte, which was also located in Bavaria. Please see the “Not Thereseinthal” section towards the end of this article. 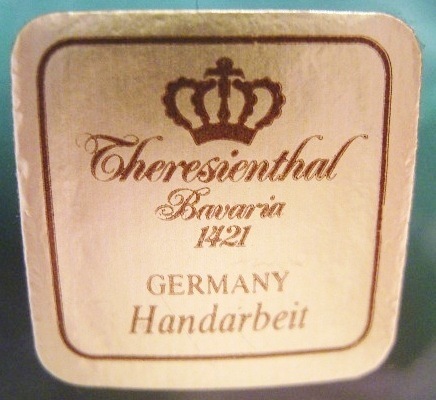 I believe that once those characteristics that I attribute to the Theresienthal factory, which henceforth may be shown in this document as simply: “T-H”, are seriously studied by the use of many comparative photographs, perhaps many more steins and other drinking vessels will be recognized by novice collectors as being produced by this firm. 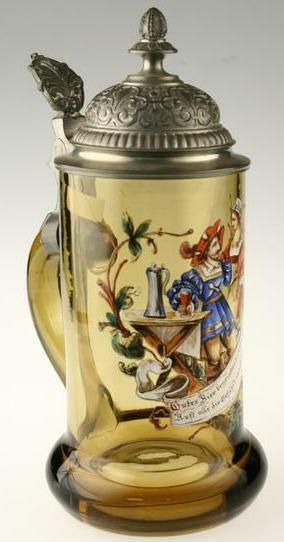 There is no known catalog or reference book written in English devoted to Theresienthal beer steins (tankards), pokals and roemers that I know of; as of the date of this latest writing (now late 2010.) 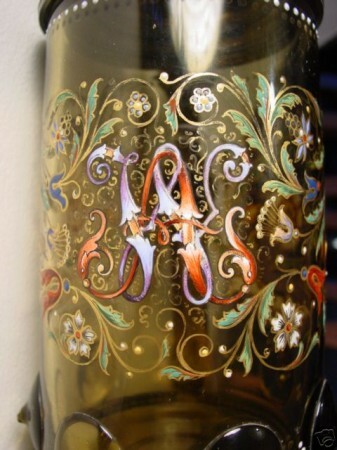 The one and only book on Theresienthal glass I have seen is about their wine glasses produced in the “Art Nouveau” period. 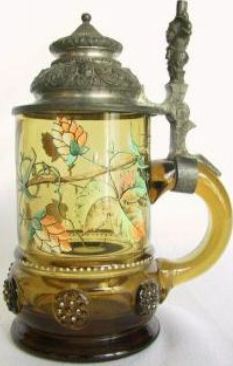 But luckily for me, (and now other glass beer stein collectors) it had one photograph on the very last page showing a ‘roemer’ with the gold leaf trimmed “Flowers, leaf and vine” design, same as one I had bought in Kentucky year ago. (See right below.) 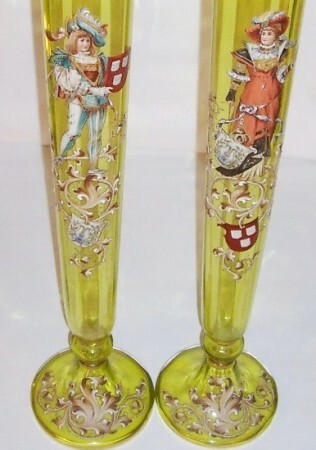 This is what started my collection of these gorgeous pieces of enameled glass from old Bavaria. This is my first Theresienthal enameled roemer, the one that started my quest. 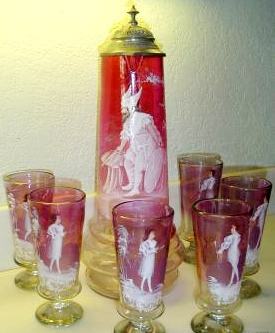 It was purchased in a private owner antique shop in Georgetown, Kentucky, many moons ago and has now lead to those “wines” and of course many steins and pokals within “From Which To Drink”, which is my collection’s name. “The art of glass making developed from the tradition of the so-called “flying” glass works. Which is, in order to make glass, great amounts of wood were needed to fire the furnaces and to produce potash, which is one of the basic materials. Hence, it was no wonder the Bavarian Forest turned into a glass making region in the Middle Ages. Once the timber surrounding their mobile (flying) glass works had been cut down, the glass makers moved on and set up their workshops in a new place. It was only in the early 19th century that it became possible to transport large amounts of wood over long distances and people began to establish “permanent” glass works, or “hüttes”. In September of 1836 Franz Steigerwald founded such a glass works in the form of a manufactory, and named it “Theresienthal” after Queen Therese of Bavaria, wife of Ludwig I. The King himself supported Steigerwald in establishing the manufactory and granted him monopoly to certain kinds of glass. 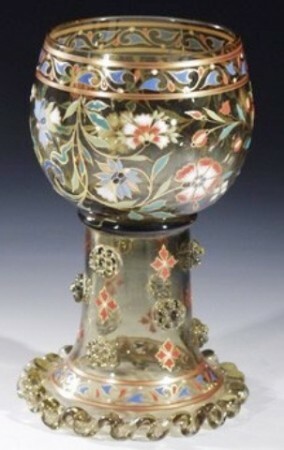 Theresienthal did not fail to keep its promise; in the shortest period of time, the crowned glass with the special lustre managed to conquer the high society of the great cities, the royal courts of Europe, and the hearts of crystal glass lovers around the world. 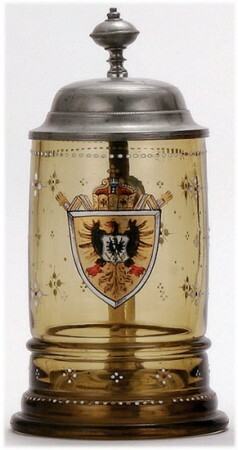 In 1861 Franz Steigerwald was succeeded by the “Glassbaron” Michael von Poschinger, who took over Theresienthal. “I have made it my goal to maintain the splendour of this factory” – these were his own brief and humble words in a letter to his customers. Famous designers created the collections and won numerous prizes at international trade fairs. In 1840 their crystal ware was awarded for “beauty and splendour of shape”, as well as “diversity and elegance of décor” at the “Allgemeine Industrie-Ausstellung” (general trade fair) in Nuremberg. At the 1867 World Fair in Paris, Theresienthal was awarded the bronze medal. Seventy years later, at the 1937 World Fair in Paris, Theresienthal won the “Medaille d’Or” (gold medal) for a crystal glass set – sometimes all that glitters is in fact gold. 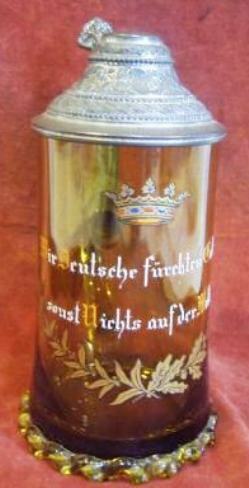 Illustrious customers ordered from Theresienthal: Ludwig II purchased a crystal glass set for his Linderhof castle. The court of the Russian Tsar ordered the fine crystal and during her exile in Britain the last empress of France, Empress Eugenie, purchased a particularly precious clock. The clock face, cog wheel and watch hands were all completely made of glass. I have endeavored to show some of the characteristics of pieces known to have come from this understated and under recognized Bavarian firm in hopes of educating glass sellers, collectors, ‘but’ mostly myself ……and a few friends that share this interest. One must remember that even after immersing oneself in all this information, the reader will still not be able to identify ALL the different drinking vessels this firm made. NOTE: THE READER WILL ‘PLEASE’ REMEMBER THAT THE ATTRIBUTION ON A LOT OF THESE PIECES IS STRICTLY THE OPINION OF THIS AUTHOR! I have tried to use the ‘Alpha” equals “Beta” method of reasoning and logic in determining what is and what isn’t a Theresienthal drinking vessel; that is: if A equals B, and B equals C, and C equals D, then D also equals A.
Theresienthal’s (TH’S) cranberry color is to the right. 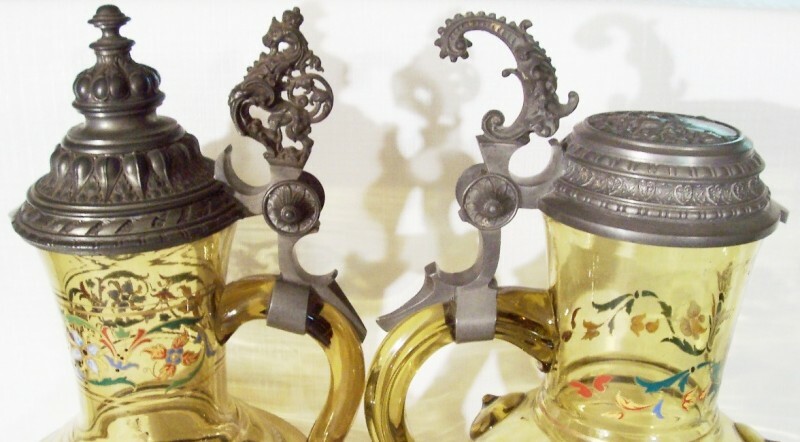 These are wine glasses, and the pewter stems were done by J. Lichtinger, in Munich, Ca. 1890. [L] TH’s “Root beer.” [R] A much different shade of green. NOTE: See “sky blue” in No. 15 below. Just below ▼: TH’s regular color of a yellow green combo. Thin, gold leaf lined flowers and leaves. Use of single gold leaf bands around the body. Use of a small white dot patten around the body, or neck of a stein or beaker. 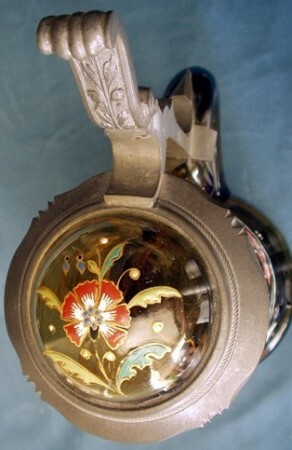 Finely detailed pewter lids or mounts, by either the firm G.Th.M or Jos. Lichtinger, both of which were located in Munich, which was nearby. “E.D. RAU- MUNCHEN”, is also seen as the maker of standard domed type lids with ball thumblifts. 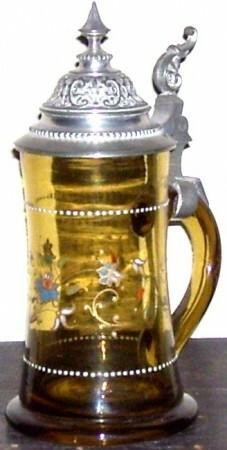 NOTE For a typical G.Th.M thumblift used on half liter steins, see No. 2 above. 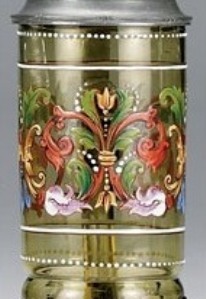 An extensive use of prunts, of which all colors were used, but the very prominent use of the dark blue prunts on their green glass bodies sets many a T-H apart. 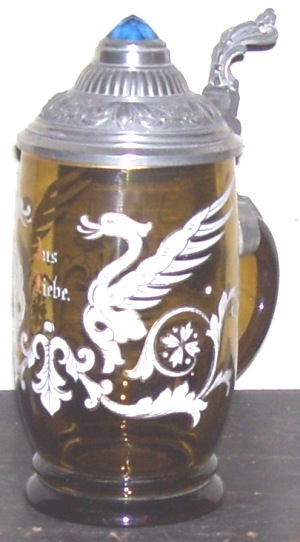 Many of Theresienthal’s steins and roemers have a twisted glass rod (mostly called rigaree , (SPELLING ?) by the stein auctioneers, but this is a misnomer, it should be called “crimped” ) applied to the base of the stein, and sometimes the neck. 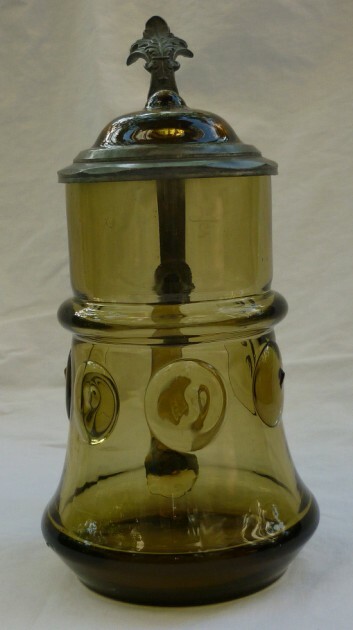 A serrated edge on a glass rope ring around the neck or stem of wines, and also used on a few steins. Very bright and consistent enamel colors for decor on their leaves, etc. such as their orange, green and blue. A light and medium tan and cream used for scrolls and vine designs, etc. the leaves /scrolls are usually one half one color, and one half the other. Bright red halos and white scrolls most often beginning with TH’s red-orange letter, for the “Münchner Kindl” series of beer steins. 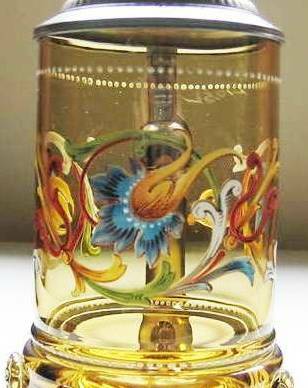 These can also be found on other smaller vessels such as beakers and wine and schnapps cups. 12. Defregger (and other artist’s) scenes in a white dotted square. Most have the dots, but not all do. 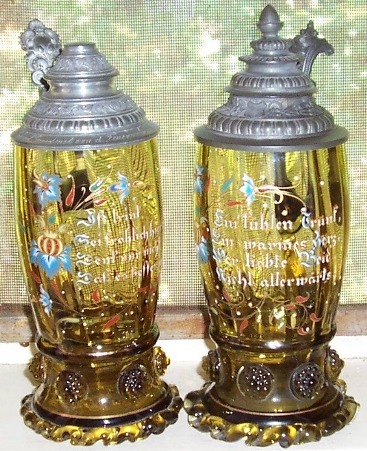 German phrases and / or bright enameled capital letters at the beginning of phrases, mostly red. Both below are 1880- 1900 versions. An inside the body “thumbprint” pattern: the outside is finished smooth ( fire polished) with the “thumbprint” (mold) on the inside and in a very small relief towards the middle . 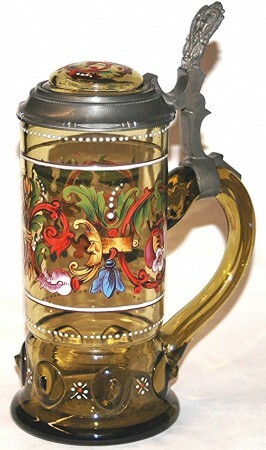 A very distinctive “C” shaped handles that most often sit low on the stein”s body – NOTE: not all T-H steins have this feature. Their own distinctive Imperial Adler (Eagle) “Arms” along with the German Imperial Crown and banner as its shield’s header. NOTE: The Imperial Adler has the quartered Prussian eagle emblazoned on its chest. Usually also shown with a four point star, with a red middle dot design on the body. Rounded edge bases with indented bottoms. 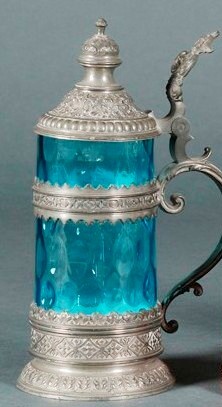 Colored glass steins with fancy pewter mounts, lids, and thumblifts made by Jos. Lichtinger’s firm in Munich, Germany, Circa 1880-1900. ABOVE: A series of colored glass steins (one came in clear glass also) with same body mounts but with different lids and thumblifts by Jos. Lichtinger, Munich. 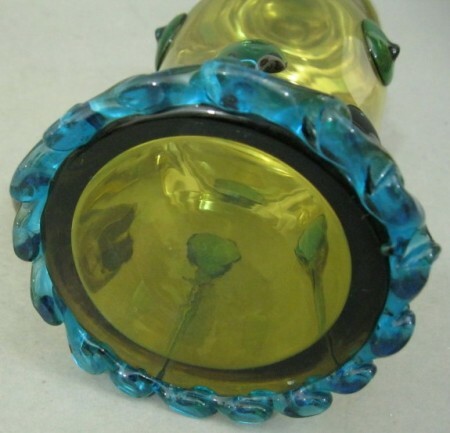 A glass lid insert with a matching enameled design, same as on the body. 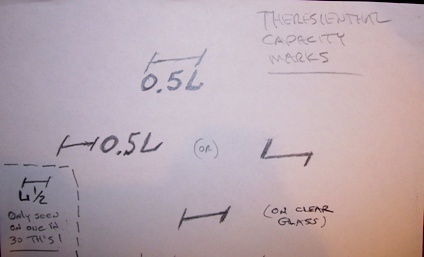 Theresienthal also used the “LAZY H” capacity mark(s) on the right side of their glass bodies. 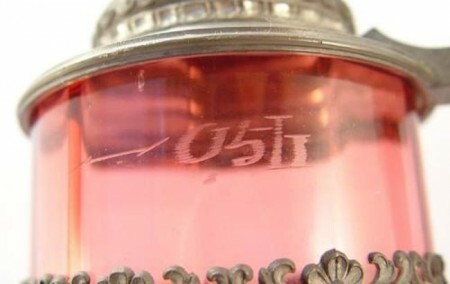 It appears that each stein producing factory had a specific way of marking the capacity level on the outside of the stein. 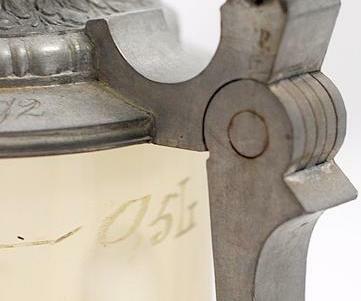 After David’s work the majority of factories could now be determined simply by knowing these capacity marks, without need of a factory mark stamped on the bottom as was common with the firms such as ‘Gerz’ or ‘Merkelbach-Wick’. All of those, which I thought were Theresienthal’s, had the “engraved” horizontal slash with small diagonals on both ends, which I am now calling: the “Lazy H” capacity mark(s). Using my logic stated at the beginning of this article, the “Alpha” equals “Beta” method of reasoning and logic in determining what is and what isn’t a Theresienthal drinking vessel works very well. That is: if A equals B, and B equals C, and C equals D, then D also equals A.”*[a] = The correct yellow-green glass color. *[a] = Correct glass color. **[b] = All white enameling or a red orange first letter. ***[c]= Use of the thick “C” handle. ****[d] = Has a “lazy H’ capacity mark. Therefore: [a] + [b] + [c] + [d] = the probability of the subject beer stein being a Theresienthal stein (vessel) would be; what?, somewhere about 65 to 75%? ** The small white dot pattern. *** Gold lined flowers and leaves. **** Profuse use of prunts, especially blue ones. ****** Marked G.Th.M. or Lichtinger on pewter lid. 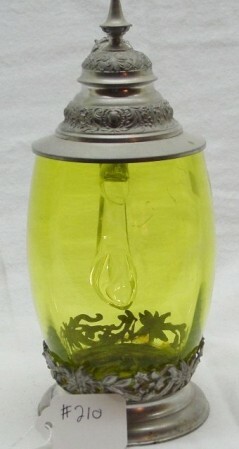 ****** A glass lid insert, matching the body design. So, for any such vessel having all these attributes, the percentage would have to be up to 95 or 100%! 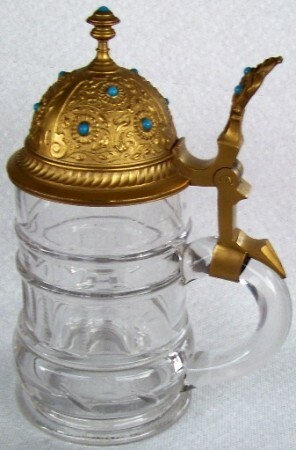 Please see the next 3 WEB PAGES for more photos of “TH” steins and their other products.